How to prepare the raw materials needed for cooking. 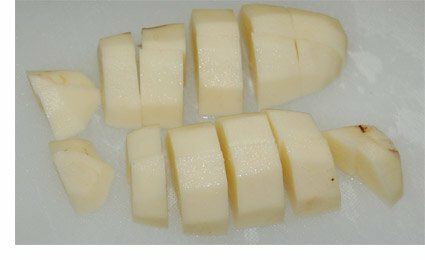 Diced potatoes are used in soups, stews, hash browns, and more, and yet you’re just supposed to know how to cut them up. Sure, there are lots of ways to slice and dice a potato, but some are just plain easier then others. We’re going to describe how we dice a potato. The pictures are of fairly large dices that we prepared for making beef stew. Start by first peeling, and washing the potatoes. Since potatoes will turn brown if left exposed to the air, if you are going to dice a lot of potatoes, have two pans of water on hand. In one pan place the peeled potatoes, and in the other pan placed the diced potatoes after you cut them. Keeping the potatoes in those pans of water will keep them from turning brown. Make sure the potatoes are covered with water. 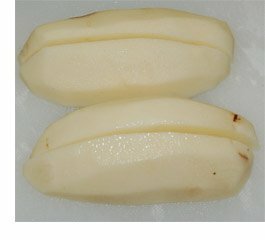 Once you have the potatoes peeled and washed, carefully cut them in half lengthwise and then place them cut side down on the cutting board. Next cut the potato half in half again. 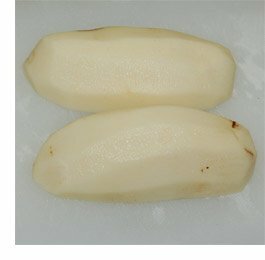 If you have very large potatoes, you may want to cut the potato in thirds instead. We want about 3/4 – 1″ dices since we’re making diced potatoes for stew. If you’re making a meal that needs smaller diced, turn the slices of potatoes so they lay flat on the cutting board, and slice them lengthwise again. The final step is to form the dices by cutting the potatoes crosswise. Make these cuts by first starting at one end, then make the next cut 3/4 to 1″ over, and continues to cut the dices until you reach the other end. The art of cooking well comes from experience. Sometimes we forget that what seems to us today to be simple to do took a little while to learn how to do right. It occured to us that one of those items is diced onions. We’re all so used to seeing them on salad bars, hamburgers, etc — diced onions surround us everywhere. Yet dicing an onion isn’t one of those skills that is readily apparent. So we’ve put together a step by step lesson on dicing an onion. 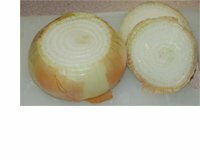 First, choose an onion of suitable size for your meal. 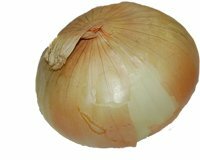 A two inch diameter onion will make about one cup of diced onion. The one in the pictures here is a large 3 1/2″ sweet onion. We’re only going to dice half of it, saving the other half in the refrigerator for tomorrow. Second, cut off the top and bottom of the onion, and discard the pieces. Next, make a small slit on the side of the onion, just into the first layer, and remove the skin. Today, we only needed the amount of half of the onion, so we cut the onion in half, and set the flat side down on the cutting board. Having the flat side down makes it so that cutting the onion is a stable action. The onion isn’t going to roll around on us so it decreases the risk of getting accidently cut by the knife. The next step is to slice the onion across the rings. 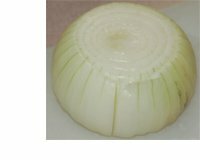 This is the most important step and it sets up the next step which will utilize the natural ring structure, and the slices we create here to produce the dices of onion. The final step is to turn the sliced onion one quarter turn, and then to cut the onion across the sliced rings. The result in each slice will be about 1 tbsp of raw diced onion. You can slice finer or thicker to produce diced onions of the thickness you desire.